Come and see all these products on our display boat "Ste'alth" in the marina. The show is open from the 12 - 21 of September. Our beautifully restored boat will be in berth 154 in the marina, a map is available on the right to help you find us, so hopefully we will see you there. These new and innovative products are available to purchase now. Please call us if you have any general enquiries regarding these products or prices. When the possibilities for Ste'alth™ Privacy Glass are endless, why should this technology only be used in offices ? 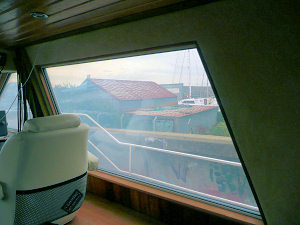 Here we have a couple of pictures of the inside of the boat. The windows are switched using a keyfob remote control and change state in under one second. As you can see the glass is especially good at handling the awkward shape of this window. Not only is the window a parallelogram shape, but it is also angled. 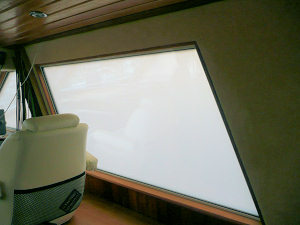 Both the shape of the window and the angled installation would be hard to accomodate with traditional blinds. The glass and boat have been featured in a newspaper article. Read the article here (2.5Mb PDF). Ste'alth sideshift offers a complete line of innovative bow and stern thrusters. 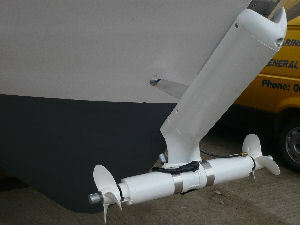 Side shift thrusters are installed at the front of the boat on the exterior of the hull creating an advantageous pivot point. The performance is exceptional resulting in optimum handling for boats of all types and sizes. Sideshift is an excellent alternative to thru-hull systems. With boats that plane, a sideshift thruster creates no drag since it rises up out of the water. With non planing craft, the minimal drag produced is comparable to the drag caused by the holes of conventional thrusters. 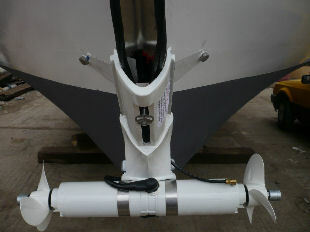 Sideshift thrusters are easy to install. 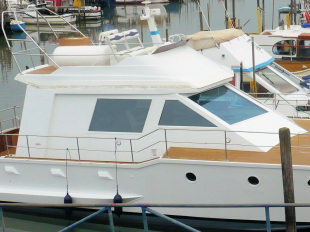 Installations can take less than one day and may be performed by the boat owner. 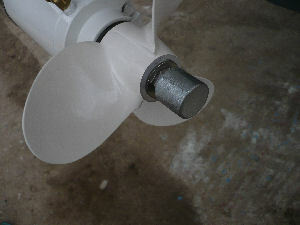 A sideshift thruster can be installed when the boat is still in the water. It is also transferable from one boat to another.